Thanks to the 1970s and '80s soul jazz movement and its 21st century counterpart, acid jazz, the Hammond B-3 organ has shown a remarkable ability to survive and adapt to changing musical trends - all without changing its swirling, pulsing tone one little bit. 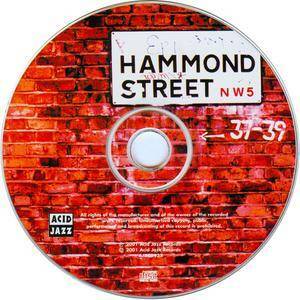 The Hammond Street anthology from Acid Jazz mixes in tracks from a couple of veteran B-3 players like Jimmy McGriff and Reuben Wilson with tracks from newer combos, and even though these newer groups cover songs like Nirvana's "Smells Like Teen Spirit," what is immediately obvious here is how much a B-3 sounds like a B-3 no matter what kind of clothes you drape over it. include the hard-charging "Itchy Feet" by the Past Present Organisation (which opens the disc), the ragged and energy-overloaded "Clubtown" by the Trashmonkeys, McGriff's "Ain't It Funky" (which indeed it is), and Wilson's "Sugar," a classic piece of soul jazz.